If you were a bee or a butterfly, wouldn’t you stop here? Even the mail carrier I met at Lucinda Hutson’s fiesta garden one morning chatted up plants and how to divide. See what’s behind her design inspiration! And check out how Lucinda puts zest into summer herbs! So, why do bluebonnets put on white or maroon bonnets? Remember the kerfuffle at UT a few years ago when maroons showed up, prompting frenzy that Aggies had infiltrated? Not true. “Blame” cross pollination in seeds that made it into this mix. And since blue is dominant, most likely future seeds will be true blue. Texas A&M AgriLife did cultivate Texas Superstar® ‘Texas Maroon’ and ‘Lady Bird Johnson Royal Blue’. Find out more. Many of us grow cultivars, thanks to clever horticulturists. One drought-tough perennial beloved for its pink flowers is Gaura lindheimeri ‘Siskiyou Pink’ that was discovered by Siskiyou Rare Plant Nursery in Oregon. It all started with native Gaura lindheimeri, beloved by butterflies on whirling white sprays of blossoms. ‘Siskiyou Pink’ does not reseed, however. Find out more. Lilies are a hybridizer’s dream, even in our gardens. I had nothing to do with ‘Linda’ Asiatic lily’s origin, though I’d love to know it! I just bought it several years ago because I love the color, even though it wasn’t named for me. Daylilies belong to the genus Hemerocallis, like my ‘Orange Crush’, a passalong from Donna and Mike Fowler. Jeff Breitenstein from the Austin Daylily Society explains how to add daylilies to your easy-going perennial design. Find out how to grow, divide, and fertilize these drought-tough, heirloom plants. Watch now! Usually, the Austin Daylily Society conducts an eye-popping show and sale in May. This year, they’re presenting a garden tour instead on May 28 to see how to include in your designs. Even though slugs and snails are pretty “sluggish,” they can sure chomp your plants quickly! The squash vine borer moth leaves many gardeners in despair. Get Trisha’s tips to take control. On tour, Pat and Tom Ellison went from basic to beautiful, starting when they spent collegiate Saturdays exploring nurseries to design their first container gardens. When they bought a house and raised a family, their passion kept growing. Now, they’ve got as many outdoor rooms as they have inside. We met Pat and Tom on an earlier visit in a former TV format. On our return, the flagstone patio that Tom laid years ago was still as level as his engineering mind. This time, he showed us how he culled stones in that pile to depict the Midwest! Pat and Tom also landed the perfect old door for their DIY privacy fence along a busy street. He finished it off with sanding and a coat of paint. To add to the ambience and soften street noise, and mainly, because Tom likes to build things, he built a waterfall and recirculating stream that meanders from front to back. Family helped build the pond, quite a new idea back then. Tom attributes CTG for his inspiration, but we were just showing off great ideas from the Austin Pond Society. Pat and Tom spot a good find in a heartbeat, including old fencing that separates interior rooms from front yard neighborly connections. To perfect his edges, Tom formed concrete and dotted with stones unearthed while digging their yard. Then, one year, they went to an Austin Daylily Society show and sale, and Tom was hooked! 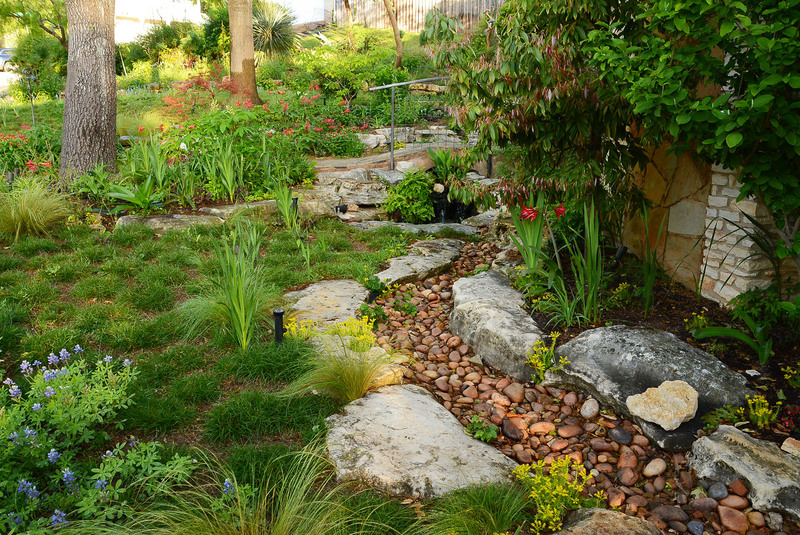 Their garden will be on the Austin Daylily Society garden tour May 28. Pat really goes for foliage and Tom for flowers. Their team work turns out stunning designs! Along with food for themselves, they grow for the wildlife, including dill for Eastern Black swallowtails caterpillars. Ever hospitable to anyone who drops by, they designed an insect hotel for tiny guests. Pat and Tom can’t resist turning random foundlings into punctuating garden art. Once a vintage car hobbyist, Tom alternates between tinkering with old parts and tinkering with the garden. One of his first sculptures is a tribute to Pat’s dad and his collection of wrenches. Everybody loves the Ellisons, as I sure do! Watch their truly delightful segment right now.